Many of our do-it-yourselfer customers do not have an air compressor and spray gun that are necessary when spraying Flextex. 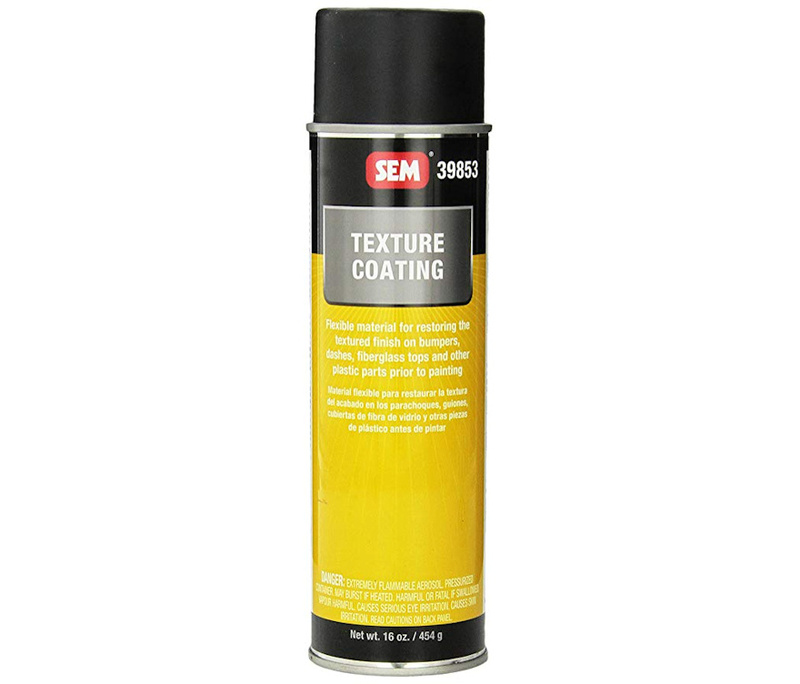 Since we don't make an aerosol texture spray, we are now stocking SEM texture coating in an aerosol can. SEM 39853 Black Texture Coating Aerosol is a unique blend of flexible materials for restoring the textured finish on bumpers, dashes, fiberglass tops, and other plastic parts prior to painting. Before applying texture coating, spray 1050-A Plastic Magic Adhesion Promoter. Spray SEM 39853 Black Texture Coating Aerosol in light mist coats 12 to 24 inches (30 to 60 cm) from surface depending on desired texture. Apply additional coats in the same manner if needed to duplicate OEM texture. Be sure to apply lightly enough so that raised texture droplets do not flow together. Allow to completely dry before sanding. Sand surfaces with 320 - 800 grit or use a gray scuff pad depending on desired texture. Blow off and wipe with a tack rag.